Planet Dinosaur Blu-ray. In keeping with the realistic approach, you won’t hear any booming roars from any of the dinosaurs. Each has its own vocalisations, but these usually consist of a honk or a squawk or a low hiss- more of what you would expect from an animal that shares its lineage with reptiles and birds rather than bears or lions. Well, you may be glad to know that the BBC’s Planet Dinosaur is a ‘proper’ documentary. It focuses on new discoveries from the last decade or so, and aims to tell you a few things that you didn’t already know- which is of course the goal of any good doco. 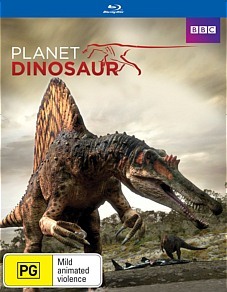 As the title suggests, Planet Dinosaur doesn’t just focus on the well-trod dig sites of North America. Over the course of the six episodes, we’re taken to some more exotic locales around the Mesozoic world, including China, South America and Africa. This means you won’t see one scale of T-Rex’s hide, although quite a few of his Tyrannosaur cousins make an appearance. It’s a shame that the chunk of Gondwana we now call Australia is ignored, because a lot of great finds have been made in this country… but I guess you can’t ask for everything. John Hurt lends credibility and authority to the program with his narration, which is a big part of what makes the show work. You instantly get the feeling that Planet is trying to distance itself from what has come before. It almost snobbishly ignores the more popularised variants, like Velociraptor and Triceratops, and ‘bigger than Tyrannosaurus’ is almost a catch-cry for the series. A big effort has been made to make the interactions between the dinosaurs as realistic as possible. Many of the predator-prey scenarios are recognisable from actual wildlife documentaries, with the lions, buffalo and crocodiles swapped out for prehistoric monsters. This can lead to some very thrilling-and grisly- confrontations as the animals butcher each other alive. The producers certainly haven’t pulled any punches with the gory presentation. It looked good on TV, but you’ll certainly appreciate the jump in visual acuity if you choose the Blu-Ray option. This is where the CGI effects come into their own: Every detail is super-defined, and you’ll notice more of the little details like glistening blood and steam puffing from a dinosaur’s nostrils. The CGI isn’t perfect, and some of the animations lack the fluency and fluidity you would expect, but overall the presentation is of a very high standard. In keeping with the realistic approach, you won’t hear any booming roars from any of the dinosaurs. Each has its own vocalisations, but these usually consist of a honk or a squawk or a low hiss- more of what you would expect from an animal that shares its lineage with reptiles and birds rather than bears or lions.